Window Screen. 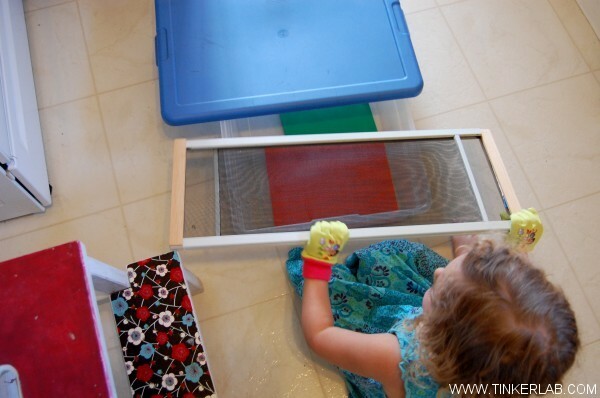 This sliding window screen is economical and reusable. Blender <<This is my favorite economical workhorse machine. Tear the paper into tiny strips, about 2″. 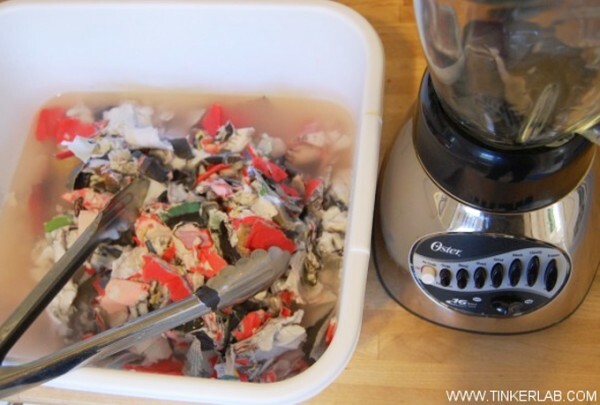 Add paper to the blender, cover it with water, and run the blender on a low speed. 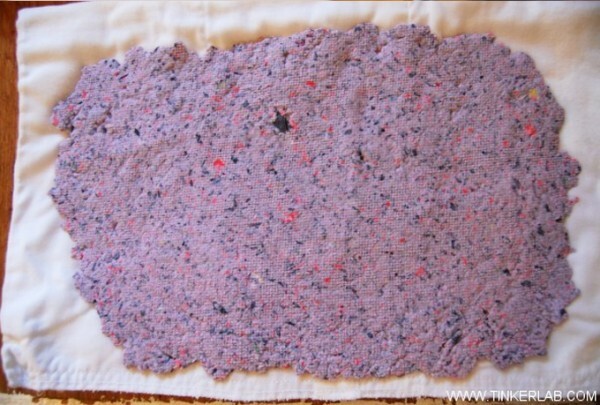 Since you will squeeze all the water out of the paper pulp, you can’t really have too much water. If the blender doesn’t move easily, add more water. 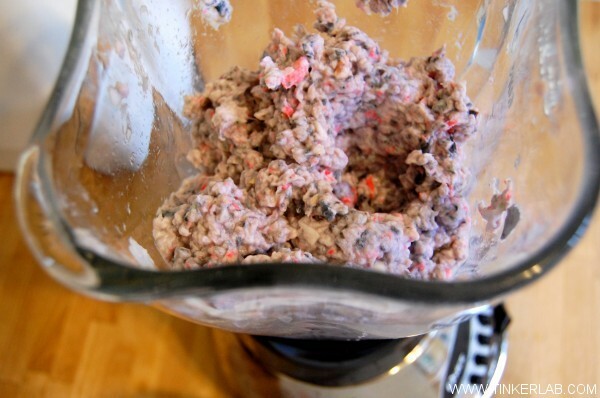 Run the blender a little bit faster until you get the paper mixture into a nice, smooth pulp. Ours is kind of chunky because my kids wanted it that way. Yours can be smoother. 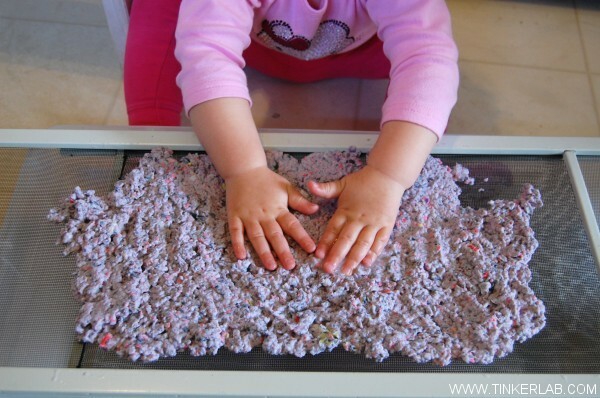 Spread the pulp thinly and uniformly across the screen and then layer a cloth diaper or towel on top to absorb the extra water, while also pushing the water through the screen into the tub. Get the kids involved. 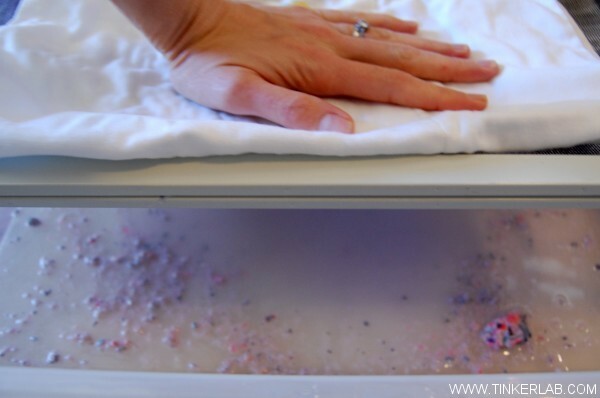 Place one hand firmly on top of the cloth while you flip the screen over onto a table or countertop that can handle water. 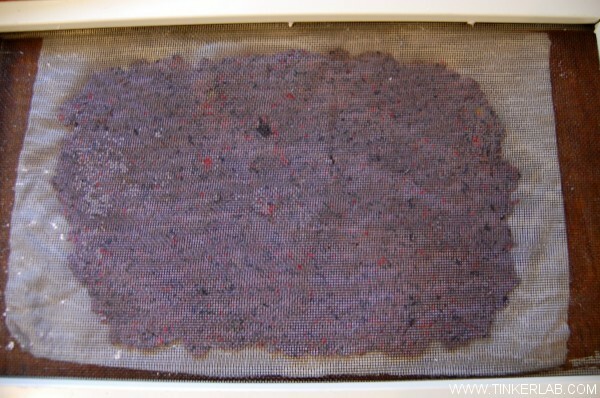 Remove the screen and put the cloth with paper pulp in a spot where it can dry, undisturbed, for about a day. The thicker the paper, the longer it will take to dry. 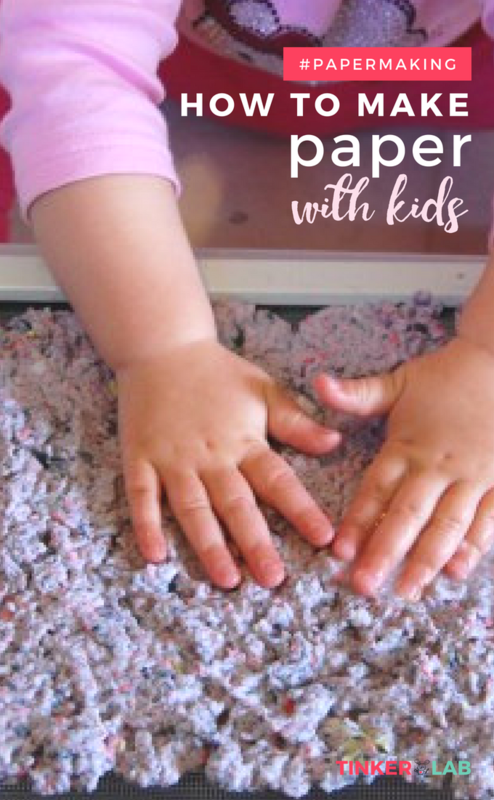 Making paper with kids requires some patience and preparation, but it’s not tricky and the process is worth exploring with children or anyone who’s curious about how to make paper. 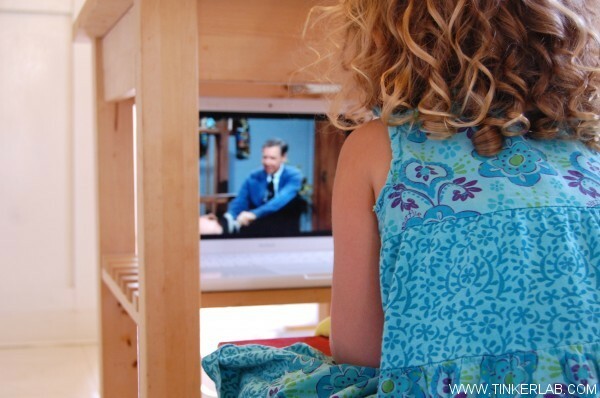 To get into the spirit and expand our knowledge of paper making, we watched a Mr. Roger’s episode about paper making. You can watch it, too! If you like this video you’ll also love learning about how crayons are made. My toddler wanted to play with the pulp right away. She squeezed it, scooped it, and carried bowls full of pulp into the living room. Fun! 7. Allow the paper to dry. This could take a day or two depending on humidity and thickness of the paper. 8. Remove your paper and cut it into pieces, draw on it, or use it in art making. Because our pulp was on the thick side, the paper doesn’t look like typical thin paper. 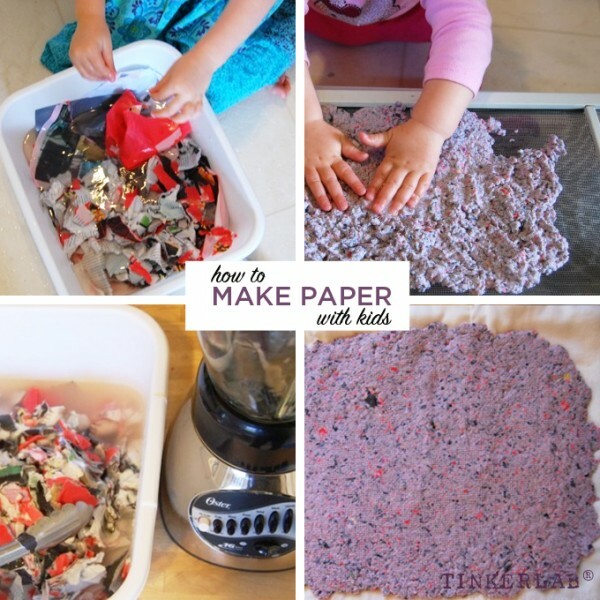 As a result of this, your child may wonder if they really made paper! This is a great opportunity to discuss and question how paper manufacturers might get such thin paper. 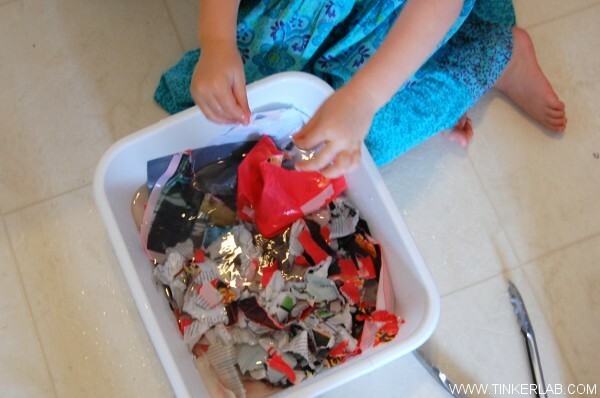 What can you do with homemade paper? We haven’t done much with it yet, but we’ll probably write on it with permanent markers or paint with watercolors. Because we embedded seeds in the pulp, we could cut these up and give them away to friends, with the invitation to plant them in their gardens. 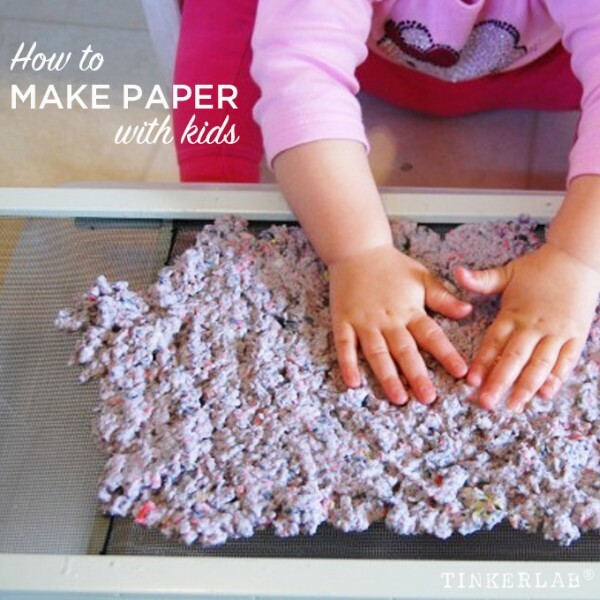 Making paper teaches children how one of our most ubiquitous materials — PAPER — is made, and it’s also a fun sensory project for kids of all ages. Allison of No Time for Flashcards used and Immersion Blender to make Recycled Paper Hearts. Kristi of Creative Connections for Kids made Wildflower Paper Ornaments (using the same screen as us!). 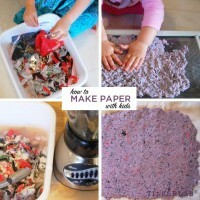 Melitza of Play Activities made Earth Day Seeded Paper.